Here is a list of all the postings Caveman has made in our forums. Click on a thread name to jump to the thread. Jeff, very similar I grant you, but, it doesn't have the square (rectangular) horizontal stab of 'ours' and it's 2" short in wingspan!! Many thanks for your contribution and interest. It looks like there are many, many models all of a similar theme, not surprising really as it's a classic trainer style. Hi Robin, thanks for your response. Is it possible for you to post a photo of your plane? It would be interesting to see it. Mike, your unknown model is very similar to 'ours', but, as Percy points out yours has a swept back leading edge whereas ours is square, and the wing seat on yours is raised - ours isn't. The fin on yours is very much the same, but yours has a strake. The wings (54" span on ours) appear to be identical. Incidentally, if the fuselage is inverted the wings fit perfectly, further suggesting it could be built as a low wing model. Perhaps this explains the mid mounted tail. Martin, I suspect this is a kit build, the formers look to be machine made (the firewall has F6 written on it, not printed). The covering, although reasonably applied, is not to the standard we would associate with an ARTF model, and the fitting out certainly isn't! Can any of you highly knowledgeable chaps identify this model? 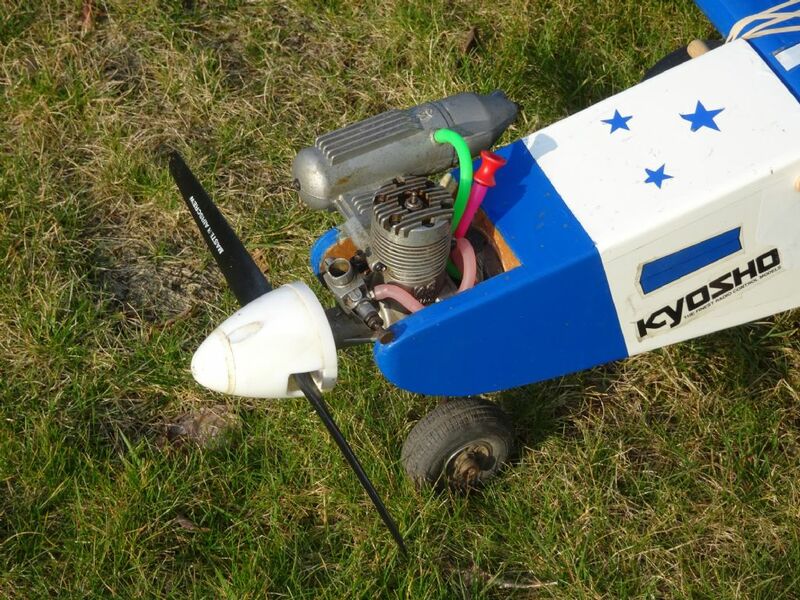 It has 'Kyosho' stickers on it, and 'Hughes 500' sticker. but I don't know if these are really relevant. 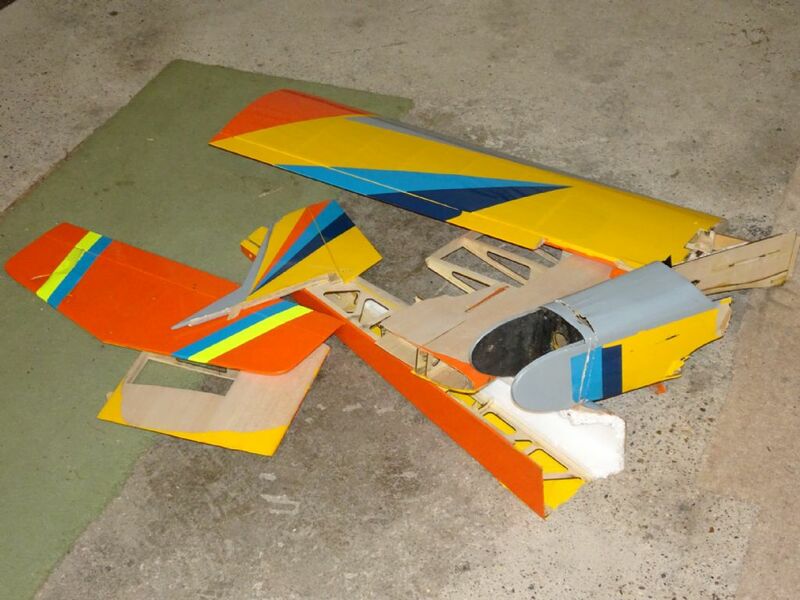 I've looked on-line and it could be something like a Kyosho Berballa (which was a kit which could be made either as a high-wing or low-wing plane), but, the vertical stab is wrong. It was bought for a member of our club by his daughter. It was in a poor state of repair and I have spent a bit of time refurbishing it. Please don't panic about the wing bands (! ), I used rubber bands purely to set the wing and I haven't acquired any proper wing bands yet. It's powered by an OS FP40 which is well-used but runs quite well. Hi Dave, whilst I can't offer any suggestions at to your lack of elevator response, I can make a suggestion ref. a new set of wings for your Pulse XT 60.
and built a replica of the original, using all the original hardware. It flies just as well as the original plane. It's not difficult to do as you can see how the original was made and mimic it. As you only need the wings it shouldn't take too long. FB3, if you look here **LINK** there are, rather poor, images of the pages from the magazine describing the Sportster. I contemplated building one of there as I have a spare OS26FS looking for a plane, hence I searched the net for info. In the end I think I may build something different, but, if yours turn out OK I may reconsider!! Aha!! Just clicked on the above link and it does indeed display the pages in question, but, they're not exactly readable!! If you're interested, send me a PM with you email address and I'll send the original files to you. However, I can make a couple of observations. The solution, in order that the tank sits level, make a replacement support from a piece of light-ply. You have found that the needle valve screwed itself in during flight. 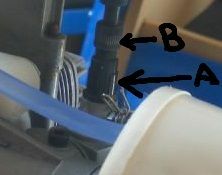 Looking at one of your photos, it looks as if the spring clip, which is there to prevent the valve moving, does not appear to have been installed correctly. If you look at the following photo the tang of the spring, marked A, should be bearing against the knurled part of the needle valve marked B. That's how it looks to me! Simple remedy, slide the spring into the right position. Mention was made earlier of a Pitts exhaust. This one shown is exactly what I used, and can be seen in this picture. The last item before 'Optional Accessories' is 6K V2 Manual, a link which opens a PDF of the manual. Have a look at page 104 which explains setting up a throttle cut and assigning a switch. 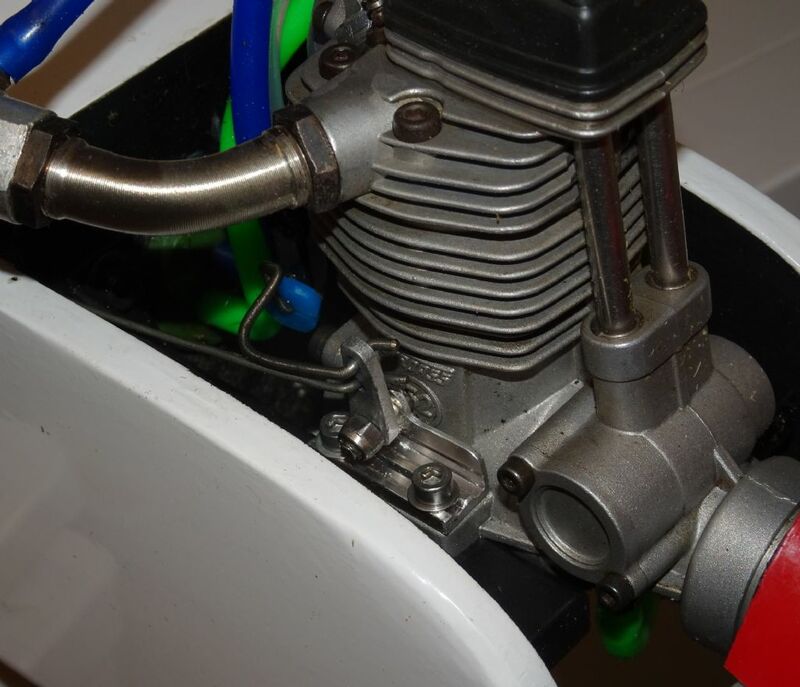 The throttle trim used to adjust the throttle idle position to suit the current temperature and atmospheric conditions, whereas the throttle cut closes the throttle to stop the engine. I always assign my throttle cut to a momentary (sprung) switch - this saves the frustration of trying to start the engine with a fully closed throttle because the throttle cut has been left active! 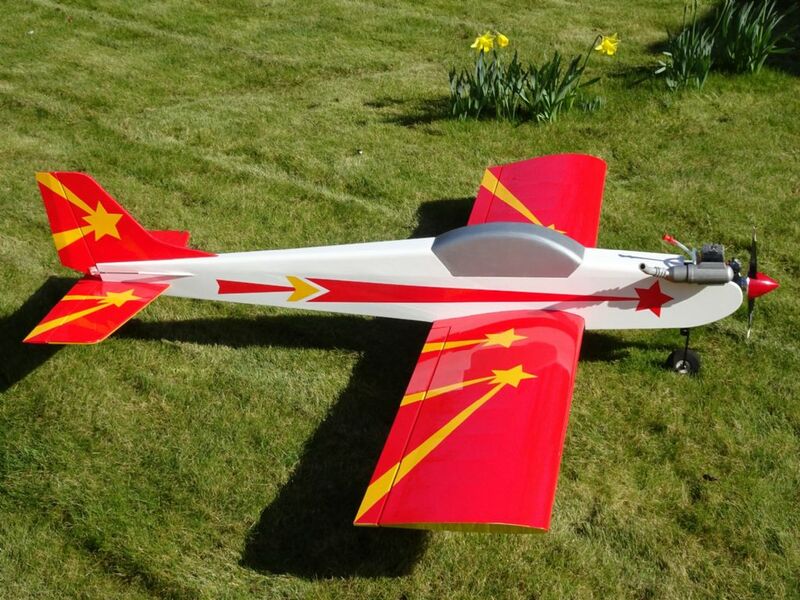 Hi Martin, I've got an OS FS26 and I too am looking for a plane to suit. There are lots of other suitable plans on Outerzone, just have a browse. Nigel, I use the same system as the Dubro linkage shown by Percy. However, I make my own from pieces of aluminium angle. This one is a little 'Heath Robinson' and really needs re-working, but it does the job. I've just finished another one for my CAP20L which uses ball-joints and is a lot less embarrassing, but this shows the basic scheme. Note that the base angle is held in place by the engine bolts which means that no additional fixings are required. 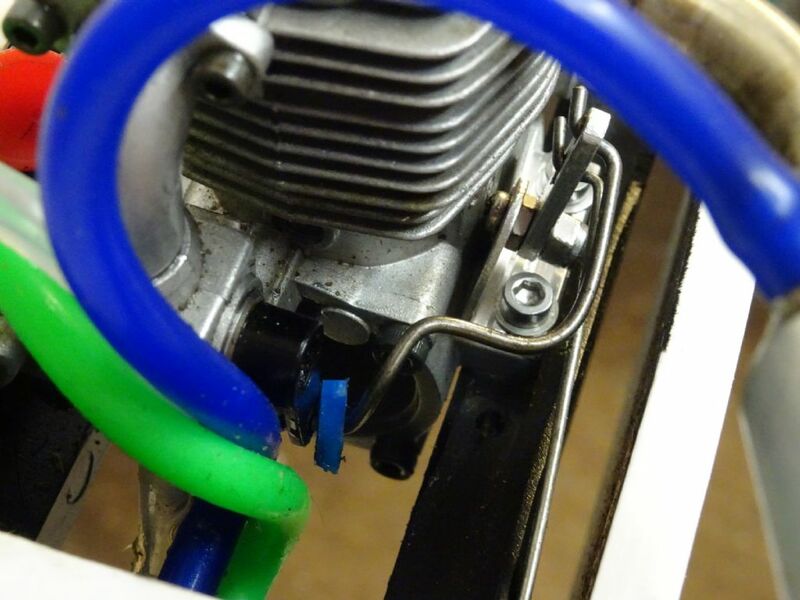 The blue 'washer' between the throttle arm and actuating rod is there to take up a bit of slack!! I would have used a ball link fixed to the throttle arm, but I didn't want to enlarge the hole in the throttle arm. Nigel, that looks like the exhaust for a 52/61 size engine. But Weston UK list the manifold/silencer for their RCV58CD engine, item no. R120601, is listed at £18.95 complete. I have both the SC(ASP)70FS and the RCV58CD and can confirm that the manifolds/silencers are interchangable. The only difference is that the RCV manifold is about 10mm shorter than the SC/ASP one. Worth a call to Weston UK? Neil, I bought a Soar 40 from Hobby King some while ago, for the princely sum of $66, when the pound was worth a bit more than now, so quite a cheap plane. It's a brilliant flier, or it was until dumb thumbs wrote it off! So I looked around for a replacement. 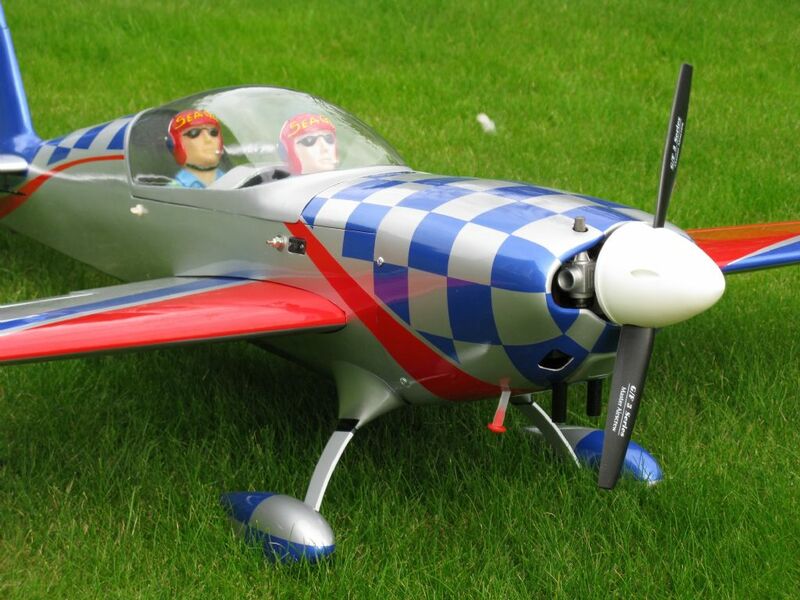 The obvious plane was the Kyosho Calmato, of which the Soar is a clone, but they're rather expensive (Yorkshire heritage to the fore!) and I also looked at other low wing trikes. However, I then decided that as I like the Soar so much I'd scratch build a copy. 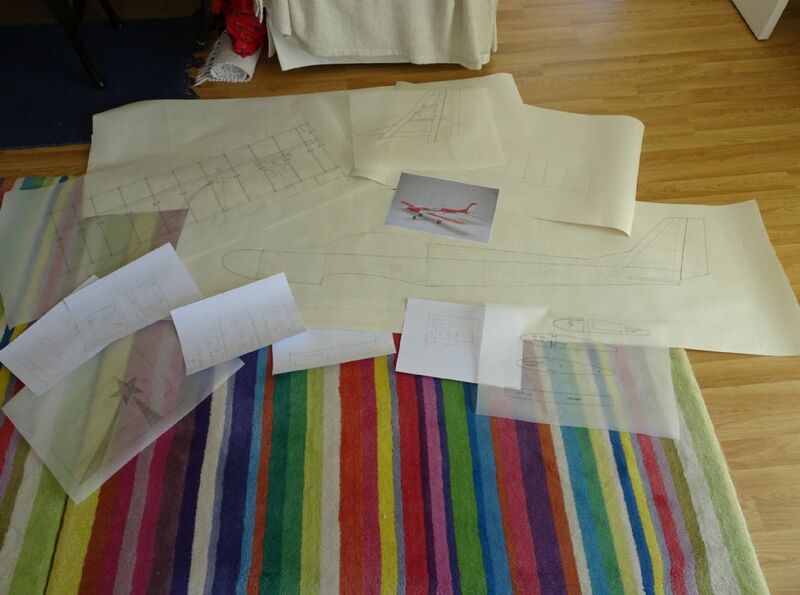 So I measured the wreckage, took templates from formers, wing ribs and the like and produced a set of drawings. This plane uses all the hardware from the original. It has flown very successfully with an ASP61 four stroke, ASP 40 and 46 As in the above photo) two strokes and now sports an OS52 four stroke. The undercarriage has never caused a moments trouble, unlike my Nova 40 trainer which need the nose-wheel straightening after every flight! I would say that if you can get a Soar 40 from your club-mate you won't be disappointed. Incidentally, I did plan to make a clear canopy from a 2 litre lemonade bottle, but the canopy is too large! Hence the solid item. If I'd realised I would have designed the canopy to be smaller. OK you have to unscrew a few screws, but let's face it if you can't do that you're probably in the wrong hobby! 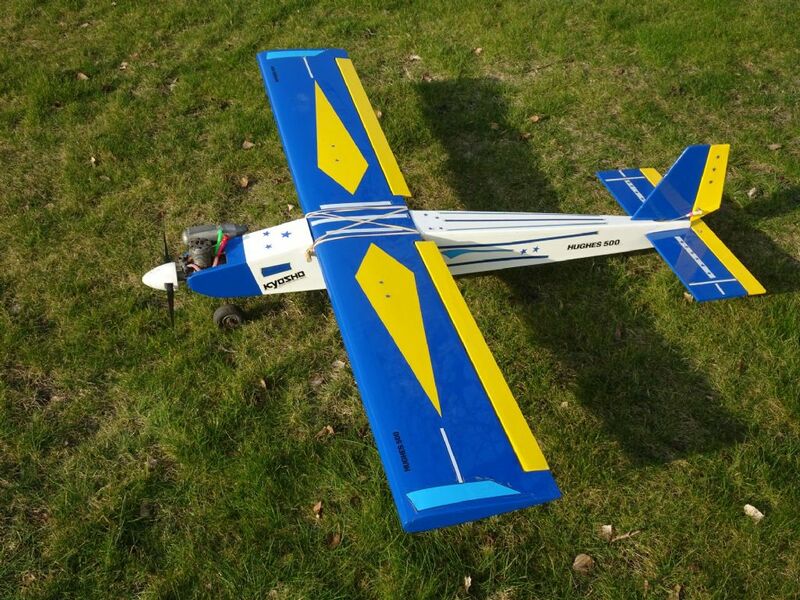 This particular one is from HobbyKing, but they are readily available elsewhere, albeit usually at a higher price! 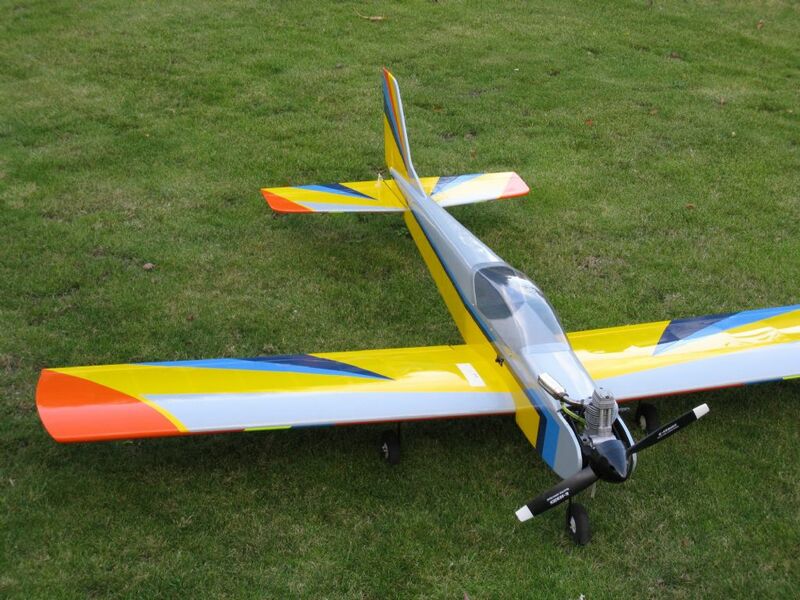 If this is the plane in question then the above battery is ideal. 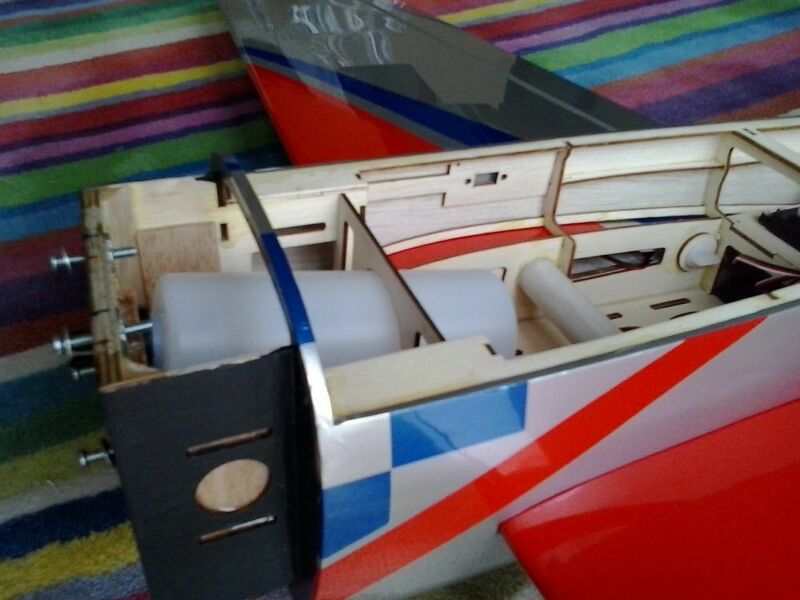 I positioned the battery in mine under the fuel tank, wrapped in cushioning foam, and the plane balanced perfectly without any additional weight. If you put yours in the same place you may possibly need an extension lead to reach the on/off switch. Incidentally the Soar 40 is a great flyer! Daithi, if you look closely you will see that there is no stock available from Banggood. The thrust appears to be OK from a 3S battery, would it be suitable?? James, Emax stuff is of good quality and Robotbirds ESCs are also good (they're re-badged Hobbywing items) both of which I've used for years. The items listed are fine for small, lightweight models. Hi James, I've looked at the links above and no-one appears to have the Flitetest power pack F in stock, not even Flitetest themselves! ESC: **LINK** not the heli one listed, but why do you need a heli esc in a plane?